When you’re contemplating leaving a job and freelancing part-time or full-time, a regular income is an important goal. Generally, you must start with what hourly rate to charge… based on what dollars you are putting into the business, your skill level, and what your normal salary would be in corporate land. 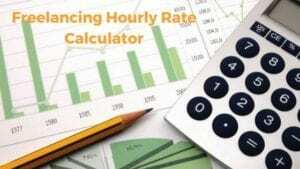 As part promotions for her book, How to Start a Freelance Business (in Australia), Jennifer has designed a freelancer income calculation tool to work out what to charge as an hourly rate or daily rate. You’ll probably need Excel or something akin to it to open it. (It’s a Macro-enabled template). You don’t need to share this hourly rate with clients; but you can still use it for fixed fee proposals that require a (time and expenses) x hourly rate analysis. You should also find out what your industry association recommends freelancers or consultants charge as well (except for the MEAA, who are complete nutters when it comes to this: $259 per hour for freelance book editing – unlikely!) Also steer clear of the AWAI copywriting rate sheet, as that is really off track for most of us mere mortals. Fill in the form below and the Freelancing Hourly Rate Calculator will be on its way. Privacy: Your email address will be kept in a ‘Freelancers only’ informative list, and not shared with third parties.